150110 That’s a big spindle shaft! 150110 That's a big spindle shaft! 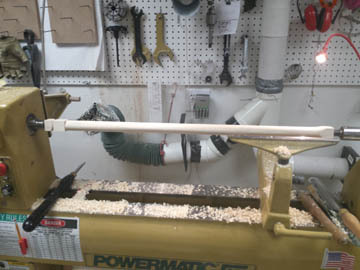 When I’m not making drop spindles, I’m typically working on custom architectural woodturning projects for local home restoration and renovation companies. In this case, I needed to duplicate 3 balusters for an old mansion in downtown Rochester, NY. These were pretty simple balusters that just had a small square section at the bottom and a gentle taper that ran all the way to the top. When turning them, all I could think about was how cool it would be to make a drop spindle to this scale. The whorl would have to be 9 to 10 inches in diameter for a shaft this long. Now that’s a big spindle and I’d hate to meet the animal that provides the fiber that would be appropriate for this spindle!